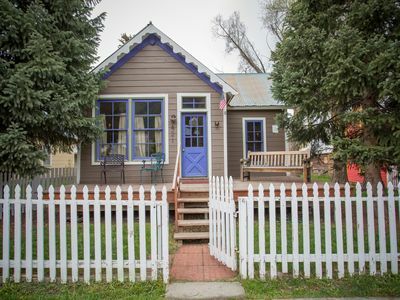 Storybook Cabin: Fenced in yard and close to bus stop! 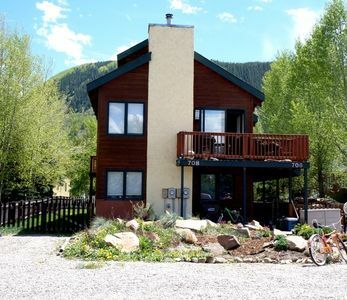 This Crested Butte vacation rental has a dreamy interior, gorgeous mountain views, and a spacious patio and yard area. 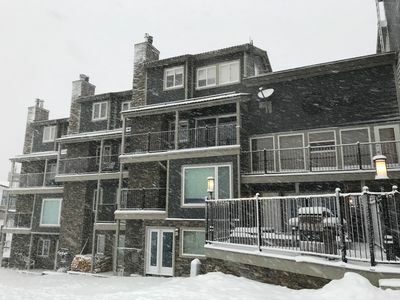 Your group of up to six can sleep here before embarking on a ski adventure or checking out a festival or concert in town. 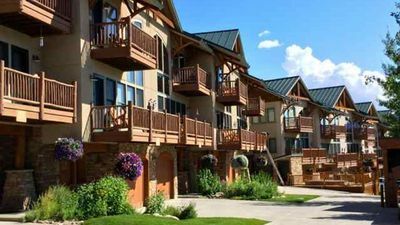 Perfect for a family vacation or a romantic getaway, this dog-friendly mountain escape is the perfect year-round retreat. 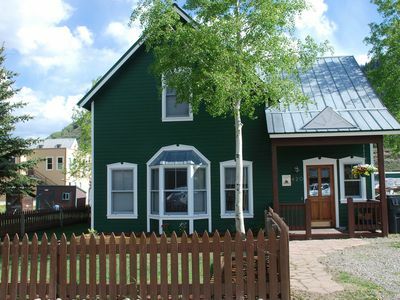 Please note, that the long term tenant in the carriage house goes through the back yard/gate to enter their dwelling. 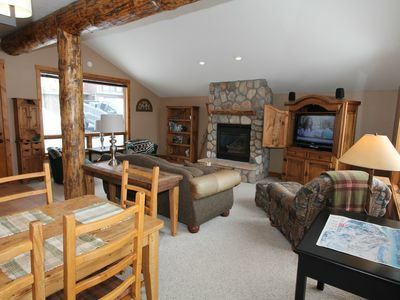 Get away to this all-seasons resort town and relax in this ideal location. 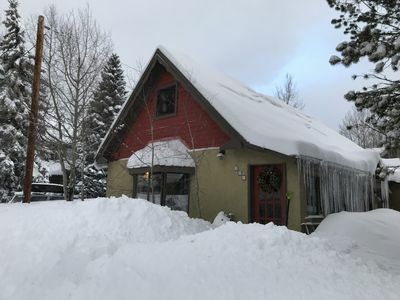 As one of the premiere ski towns in the nation, this cozy Colorado home is on historic Elk Avenue. 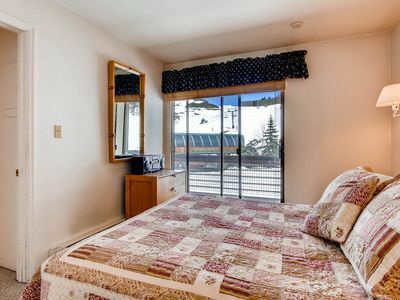 Besides giving you the front row seat for festivals and town events, this location also gives you perfect views of both the town and the surrounding mountains. 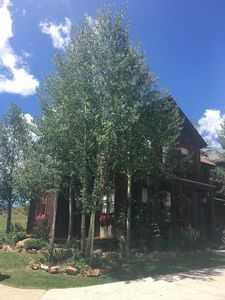 After stepping through the idyllic white picket fence and climb up the wooden stairs, take a moment to relish in the mountain views from your charming front porch before stepping through the bright blue front door. 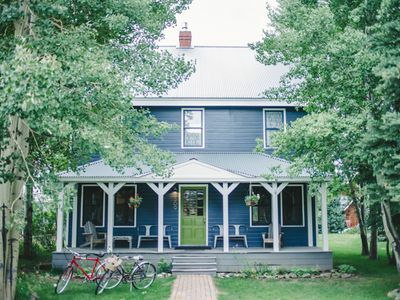 Elegant and rustic with exposed wooden beams and whimsical, antique details, this amazing home is nothing short of a dream. 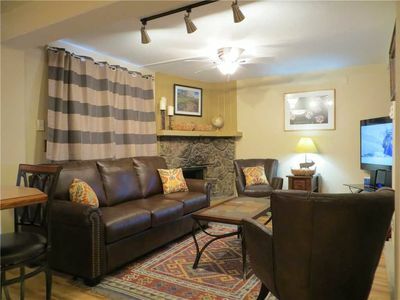 When the snow is coming down outside, brew yourself a hot mug of tea and relax in the cozy living room on one of two couches or the comfortable armchair, enjoying the beautiful decor and elegant furnishings. Here, you'll also find a flat screen smart TV along which, has 10 cable channels - perfect for keeping up with all of your favorite shows! Pop in a DVD or sign into your Netflix account for a family movie night! 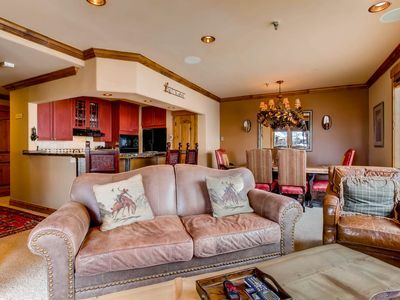 Getting away from it all is made all the more fun here with the provided games, including a beautiful chess set right by the window, where you can challenge a friend or family member to a match and gear up for that "checkmate." Do you love preparing meals to save money on vacation? Here, you'll find a charmingly rustic kitchen, which balances state-of-the-art appliances with a classic ranch house feel. A large dining area can seat 10 guests on benches, and more seating space is available on stools around the large center island counter. Downstairs, two of you can sleep in the queen bed in the master bedroom with gorgeous wooden ceilings and floors and ornate, regal decor. Two more can sleep in twin-size beds upstairs in the loft area, and two more can sleep in the sofa bed. Four adults will sleep here comfortably, with a max occupancy of six. 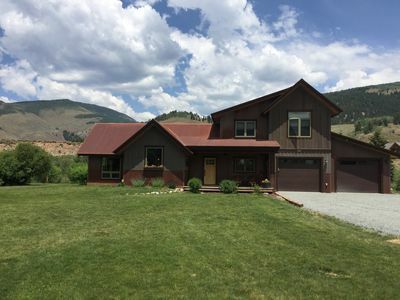 This makes a great rental for a family, or multiple couples who are very good friends. 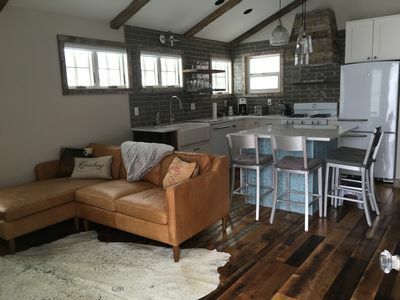 One full bathroom and a half bath are included in the home with their own rustic charm! Enjoy taking long soaks in the claw foot bathtub, which also includes a shower attachment, enjoying a glass of wine with your bubble bath and all of the details around you, from wall art to a basin sink. We understand that your dogs are by far one of the most important members of your family. Two of your furry friends can come along too - don't let them miss out on all the fun. 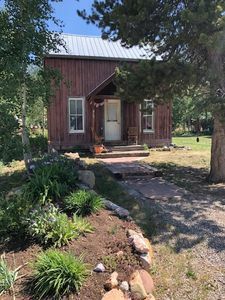 In the summertime, the front porch is a great place to relax and enjoy the sunshine before heading out on a stroll through town. Between a bench just under the windowsill and a French bistro table with a couple of chairs, there is plenty of patio seating to suit your needs. 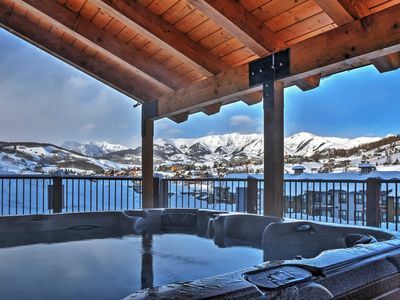 Lovers of all things winter sports flock to Crested Butte, so if you can't get enough of skiing or snowboarding, this is the place for you. 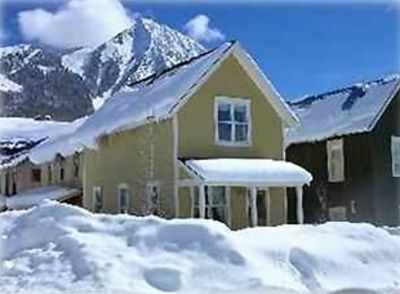 Crested Butte Ski Resort is just a three-mile drive away, but if you feel like hopping on the ski bus, you'll find a bus stop just a block and a half away from your doorstep. 3/20-26 open! Lots of snow! 5 star reviews! 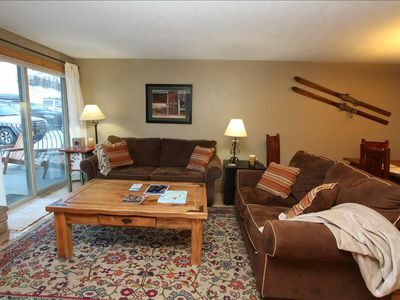 2BR Townhome Next to Park. 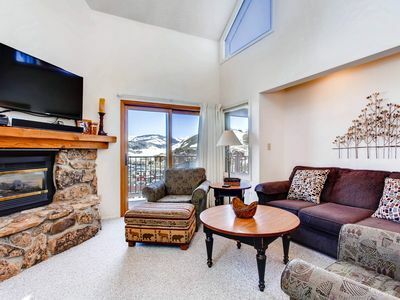 Fenced Yard, Fireplace, Views! 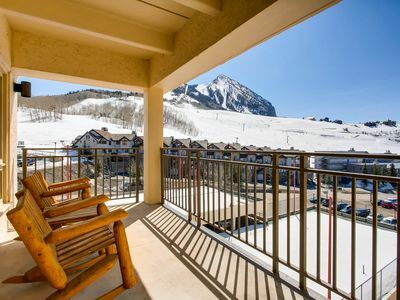 3BR Crested Butte Townhome w/Hot Tub Access! 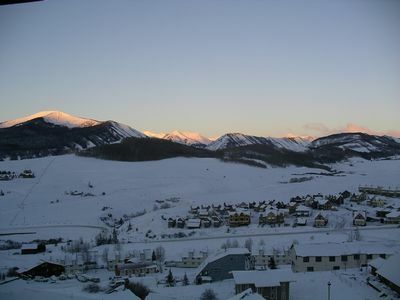 Ski/Bike Crested Butte, Live Simply. Enjoy Historic Downtown ! Ideal Location ! MODERN/RUSTIC MOUNTAIN HOME ON CEMENT CREEK. FISHING. 10 MIN TO CRESTED BUTTE.